Mon Ami Gabi's Vegas location is perfectly acceptable for lunch. 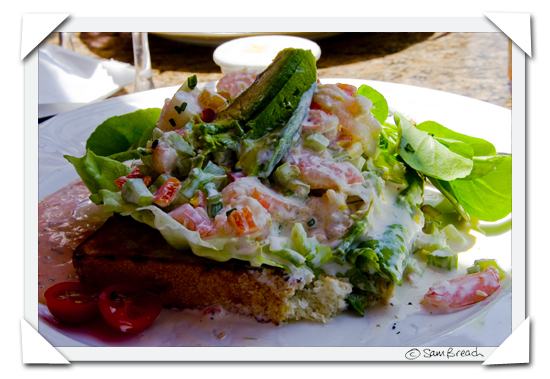 On the last visit I had an open face shrimp sandwich with avocado that was bright, fresh and tasty, but then it wasn't trying to be French. Fred, on the other hand, is always searching for that little piece of home. The Frisée & Bacon Salad (ziz is way too sweet) and the Croque Monsieur (awfooole) did not hit the right French spot with the Frenchman, but he did go mad for the super-rich Macaroni & Cheese, á la Française with ham on a previous visit. Whatever you end up with, you'll certainly have a lot of fun choosing from the large and varied menu. Anyway - that the food is not perfect can be irrelevant. You don't come here just to eat. You come here to waste some time people-watching the freak show that Vegas can be pass by. For this you'll need an outside table. Our tip is to book on Opentable and then ask for an outside seat when you arrive. You shouldn't have to wait to long and there is always the bar and champagne availability to help you while away the minutes until a prime people-watching table is ready. If I were you, I would avoid the C'est si Bon because Ce n'est pas bon, (a cocktail that is way too sweet), but the Bloody Marys are another good option if bubbles aren't your pick me up. Service at the Vegas outpost of Mon Ami Gabi has always been exemplary and although I am not 100% sold on the food, I am sold on the location, the friendliness of the staff, the view of the Belaggio's fountain display and the chance to rest my strip-tired feet and watch other tourists do the walking. 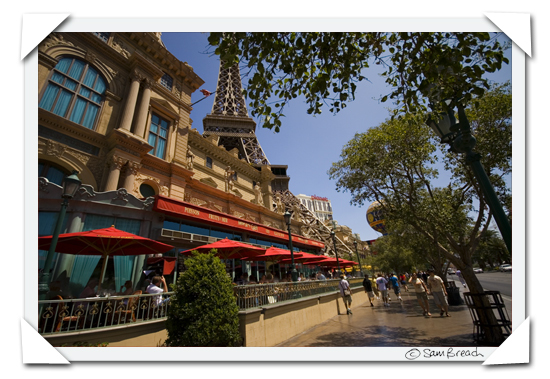 We visited Mon Ami Gabi twice before writing this post. I love your Fred impressions! It sounded just like him. And, alternatively, if the weather is uncooperative, you can do some pretty mean people-watching at the Grand Lux cafe at Venetian. 'Specially if you happen to be there in the days after CES in January. 'Cos it's usually AVN award season. Heh. We ate lots of Croque Monsieur in France, some were better than others. Dillon was really taken with the Croque Madam. My wife and I stayed at the Paris when we married over 5 years ago and we were not impressed. Bad food, bad service, just bad all around. Oh well. If you're planning on staying a bit longer, I'd be happy to put you in touch with my brother - he works at the Four Seasons above the Mandalay Bay and knows all the city's ins and outs. We have a trip planned to Vegas at the end of October. Thanks for the tip. I always thought that restaurants with a view, especially one like that of the Eiffel Tower, would have bad food. But you've proven the opposite! Perhaps you're just more charming than the rest of us..
Sam - My partner and I, too, have taken to eating at Mon Ami Gabi for lunch if we're passing through/going to Vegas. I usually have nothing more than a rare steak and frites to be washed down with a glass of wine. A perfectly decent lunch. The service has always been very good and, as you state, one has a prime view on the Strip. Come to think of it, I have actually had worse steaks than this in France (anything too sinewy is a ridiculous offer when not braised or stewed). Did you say an outside table? Outside? In 107 degree heat?!!! Nothing would taste good to me at that temperature, I fear. "Awfoole" - I love it! I have never tried this place but I've always wanted to. My favorite place like this in Vegas is the Fontana bar at the Bellagio, with the outdoor terrace. I always have to have a glass of champagne. I see it's now 3 years since your post about Thornbury! We were there in August of 03. On the way there we went to Glastonbury and Cheddar, which was a really fun day. I remember we ate lunch at a place called Rainbow's End in Glastonbury, sort of an earnest hippie-ish vegetarian restaurant, but it was good! Amy - I thought I went a bit over the top because he doesnt really say 'zis'. He does however say awfoole. Fatemeh - the weather always cooperates in vegas! I think they have heat lamps. We last ate outside there at the end of November and it was fine. Beccy - tell Dill I am a Croque Madame fan too, Mmmm. Stephen - are you talking about the hotel or specifically Mon Ami Gabi. I haven't stayed at the Paris myself and probably wouldn't choose to. Fred stayed there once on a bachelor party weekend and told me it was average. Personally I think that most of the hotels in Vegas are too big to expect any particularly personal or special service. Hey Doug - thnks for the offer but we have been and gone already. We wre there a few weeks ago. And staying at the Mandalay Bay so not too far from your brother. Mrsl keep reading - I will have some more vegas words before july is out. I also have other vegas reviews listed in my blog roll. David - I dont think I proved that. Maybe I proved the opposite. I heard the restaurant on the real Eiffel tower is actually good. shaun - I think you sum it up - decent and pleasant enough for lunch. Maybe I should try the steak next time - except steak always seems a bit heavy for lunch - especially when you are saving your special meals for the evening. Alyce - it's Vegas - the spray you with cooling mist as you dine. It's lovely. Alice - this is a fun place for lunch - try it next time. Did you read Jeffrey Steingarten's article in Vogue about Vegas food? I'm a sucker for a good buffet and I love the Wynn buffet - they have a great congee station. Will check out Chez Ami next time we go through, though my husband pretty much loathes the city itself. I've been to this restaurant in Chicago, and I had a similar experience. We had high expectations, as we went there for my parent's anniversary dinner, but we were quite disappointed! Also, at the time I was young and didn't know the characteristics of French food. But, let me tell you, this place surely did not help out! It just seemed like another average restaurant with expensive prices! Interesting to know a sophisticated food blogger like yourself shared my opinion. The Steak Frites are great and the people watching is unparalled. I love Mon Ami Gabi!